After my last report I have worked a few more contacts. On August 5th I worked RT9K/P on 20M CW from AS-109. 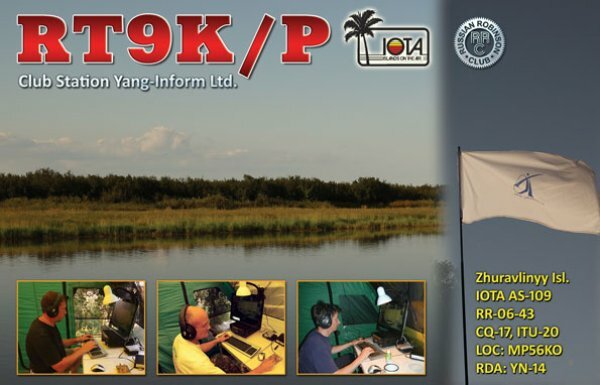 On August 6th I worked RT9K/P and XV2JJ on 30M CW. On August 8th I worked SQ9BDB/1 on 40M SSB from EU-132 and R20RRC/8 on 40M CW from AS-109. I also worked V5/DK9IP on 40M CW for a new one on 40M. On August 9th I worked TM0SM on 15M CW from EU-081 for a new iota. On 6M I worked LA/SP7VC from KQ21, SM5EPO/2 from JP97 and EI9E/P from IO55 for 3 new gridsquares. On August 10th I managed to work NE1RD/1 on 17M SSB from NA-148 for a new iota. He was very weak, but I kept listening to his frequency and he came enough to make a contact. On August 11th I worked LA/SP7VC again on 6M, this time from KQ00, which was a new gridsquare. In the evening I noticed a spot for PY7RP/P on 15M SSB. He was operating from iota SA-046. At first I didn't hear him, but then he appeared and I managed to work him for yet another new iota.